This is a gutsy guac! 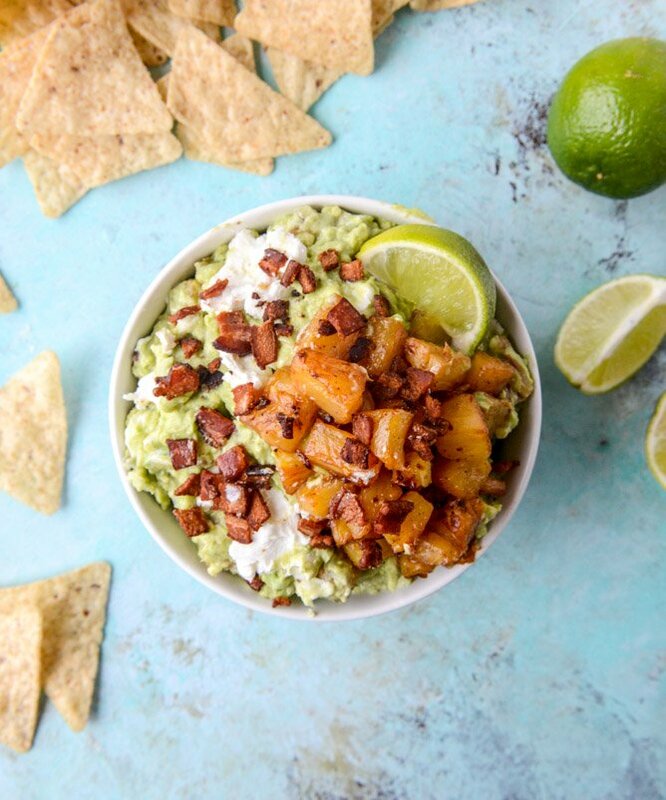 I’m normally a lot more traditional with my guacamole too .. but if you say it’s good, i’ll have to try it and hello… bacon – YES … goat cheese YES YES YES YES YEEEESSSS. This looks like such a show-stopping guac to bring to a party! We are definitely friends! This must seem so natural when you think about it. Salty Pork juice fusing with the burnish edges of cooked pineapple would be perfect on smooth avo. I do not blame you being so excited; I am too! OMG I JUST made a caramelized pineapple gauc. Not in bacon grease there. So you win there! But I think bacon needs to be in my next go around! Caramelized pineapple? Speaking my love language right there. We are more than friends. We are BFFAEAEAE after this recipe. Holy schnikes Batman, this guac is da bomb!! Seriously can’t wait to try this one. I’m wiping the drool from my mouth as I type. Great recipe! I could put pineapple on almost anything (pineapple + hot peppers + bacon on a pizza? YES PLEASE!) but I live with a man who sees that as an abomination. I’m going to need to make this in secret.. and then devour it all. Looks awesome. Never would have thought to add pineapple to some guacamole, but.. um.. Yes please! Amazing flavor combo! I can’t wait to try this. My PERFECT guac is Chipotle’s. UGH. So good. I can’t even (ew). But seriously, ,I think it’s the onion? IDK. I just know I love it. And I go to Wegman’s to get a HUGE container of the grilled chile pineapple on their vegetarian bar. So delicious. My goodness, this sounds amazing! Trashy is awesome! This is by far the most creative guacamole I’ve ever seen. It looks delightful. Goat cheese above everything! i currently have all the ingredients to make this, so i think i just must. my boyfriend will be appalled. it will be great. Oh my god….ahhhhhh….I want this in my mouth right now. Who needs chips? Give me a spoon and I will be happy. As a California native and fellow guac lover, I am SO excited for this recipe! OMG, Jess, this is amazing! Your dip game is seriously unreal. I’m not sure if I can handle it all but I am going to figure out a way…this looks so crazy good! Holy cow that looks amazing. Can’t wait to try this! That caramelized pineapple…I want that on everything! Especially guac! Looks amazing! Umm….this looks delicious, I don’t know what you’re talking about! I love caramelized pineapple in everything, so this sounds like something I would adore! Great recipe! As a self diagnosed guacamole junkie, this looks sooo good! I love putting twists on the originals. Cant wait to try it out. This looks delicious! I made one with grilled cherries and white pepper that was also good. The fruit is surprisingly good in guac! That is so creative! I love your trashed up recipes! This sounds fantastic! Are we still friends? We just became besties! You know have my undying loyalty… Everyone says I make great Guacamole, can’t wait to shock and awe with this one. You’ll get the props, promise!! Wow talk about a party in your mouth – these flavor combinations sound sensational! My parents always had bacon grease saved. I made some bacon last week and had some grease leftover and thought, “I really should save this…” But I didn’t and nowwwww, I have to wait until I make bacon again to make this guac. I don’t think my husband is going to be down with the pineapple, wait…I just showed it to him…he’s in! Alllllrighty then…let’s get this thing done! Is it wrong that sometimes I bribe my husband with bacon grease? This trashy guacamole is right up my alley. I deconstructed the guac and served all the components with shredded pork and served as tacos. Super fun! This is amazing Jessica! Love all the greasy dishes. The recipe is about to be my mantra. Just kidding. But absolutely love it. Thank you for bringing such an amazing recipe to the internet world. This is so wrong it’s right. Dear lord. I cannot wait to try this! I love appetizers and pineapple and adding bacon is genius!